I guess we here at ATH have been living under a rock for the last couple years because we truly have missed out on new Austin band Agent Ribbons. The ladies in this band made way to Austin recently by way of Sacramento and have been making a name for themselves around town as of late. On their upcoming release, Chateau Crone, these ladies of rock create a dirty garage rock sound most similar to Dum Dum Girls or maybe even a more psychedelic version of Best Coast. Whichever way you want to call it, this band means business with the heavy garage pop sound they produce. Below you can check out the band’s latest single called “I’m Alright” which is a true representation of the Agent Ribbons sound. We’ll be keeping track of this band is the tour the country and return for more local shows later this fall. Over the last week or so I’ve found myself giving some heavy spins to the tunes created by Austin electronic-pop group Paperthreat. 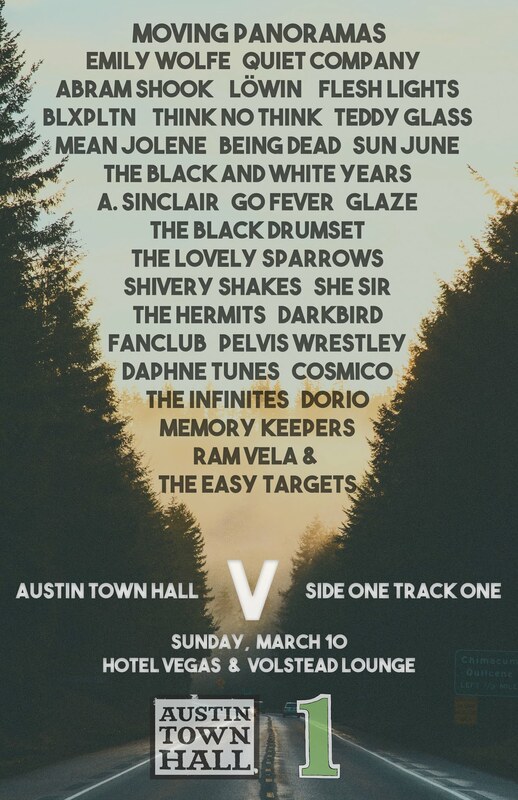 The band is fronted by veteran to the Austin music scene Rene Rodriguez who has been actively involved over the years in bands like Great Nostalgic, AM Syndicate, HumbleBums, and a few others. After Rene tired of his previous groups, he struck out on his own and began Paperthreat with drummer and former bandmate Vincent Durcan. The two then enlisted the help of Arius Holifield and guitar player Niko Bakulich to round out a live band. In the short time the band has been in existence, Paperthreat have only one EP which you can download for free over their Bandcamp site. I’ve been jamming that EP for a couple weeks now and I’ve yet to come up with a comparison I feel confident about. That’s a good thing thought right? Download that EP or have a listen below to their jam “Conveyor” and make your own comparison. If you care to see the band live, head out to Beauty Bar tonight (6/30) for a a free show starting at 10pm. Zlam Dunk will be headlining that one. What?! New tunes? And a new record?! We’re really excited to bring you an update on one of Austin’s greatest little indie darlings, Hollywood Gossip. Having been away from the scene for a short bit, the band are now returning with their debut full-length, Dear as Diamonds. Using clever lyrics and catchy hooks, the band has won over many fans in our city, continuing to churn out pop gem after pop gem. Their last EP, You’re So Quiet, featured sunny guitars with a touch of twang, along with steady drumming and distinct vocals from Tyler Womack (“Bicycle” was one of my favorite jams for months, and tonight). One of our favorite things about the group is that they’re likely to always look on the brighter side of things, never getting too deep into subject matter; this all leads to great fun for the audience time and time again. Speaking of audience, the band will be playing their CD release on June 19th at the Ghost Room. Austin band Sleep Good is the brain child of local resident Will Paterson who has spent time in big name bands like Sunset and Sound Team. Will could probably be most closely compared to Alan Palomo since both are young lads in their very early 20s and both have already put out massive amounts of creative material in a very short amount of time. For the longest time, Will worked on his Sleep Good project completely solo and only used the name as a creative moniker. A year or so ago though the solo moniker became a full blown band with four other members who have been doing some light touring as of late around Austin. You’ll be hard pressed to find recorded material from Sleep Good that you can actually download or purchase other than their Autobus Records LP Skyclimber. I’ve gotten my hands on that album and have really enjoyed the material as one of the most creative pieces of work to come out locally this year. You’ll also be hard pressed to put a label on this project from Patterson. At times you’ll hear British twee mixed in with some of the noisier pop elements of Pet Sounds. Then after you think you’ve got it all figured out, you’ll hear a song like “Shoney’s” which sounds like a new take on “Crazy Little Thing Called Love” as performed by Queen. Needless to say, I’m liking what I hear. You can download the new record digitally via Band Camp or on the Autobus Records website. We spend a lot of our time focusing on the rock around Austin, but rest assured, we love to shake it just as much as the next guy does. Recently, the Austin scene has been boosted by the rise of FreshMillions! , and their main guy Geoff Earle. They’ve been hitting the town with the likes of Focus Group and L.A.X. (who they will be supporting May 19th), making a name for themselves with electrifying shows that leave the audience drenched in sweat and coated in euphoria. Not to mention that a lot of people love the fact that Bryan Ritchie of The Sword (and Skate or Die) helped produce the record, but as much as we love Bryan, you have to know that those groove-tastic bass lines and electric shine were all there beforehand. Be sure to check out the band’s self-titled debut record, and attend one of their live shows because pretty soon, the whole town will be aboard this dance-a-riffic party bus of fun. It’s been awhile since our last artist to watch feature, so we thought we’d press on this week with Austin band The Clouds Are Ghosts. The band has been building a lot of deserving positive press recently around town on sites like The Austinist who also dropped an interview with the band several months ago. Being a bit new to the Austin music scene having formed only in 2008, it’s surprising to see such a fresh band growing so quickly. The recent rise in popularity is of course attributed to the quality of the band’s sound which has been compared to their Radiohead & Massive Attack cited influences. This writer is ready to call them a more atmospheric and electronic version of European bands like Muse. You definitely won’t hear the wailing rock guitars like that band, but Clouds Are Ghosts certainly have that “epic” feeling to their music. The band, fronted by Jason Morris, recently came off an east coast tour and also just released their debut self-titled LP back in September. We’re jumping on the hype bandwagon with this band and we’re betting you will too. If you’d like to hear more, the band is currently offering up their new LP for free high-quality download on their website. Live shows coming up are February 27th at Mohawk and a few TBA shows during SXSW.